I blame Brent A. Harris. No, really I do. But before I get to exactly what I blame him for, let's step back a moment. Inklings Press came about when a bunch of authors, scritch scratching away at our various works, decided it was time to up our game and turn our ambitions into reality, self-publishing some of our stories. Tales From The Tavern was our debut - a collection of fantasy stories - and by the time Hallowe'en was rolling around, we had a horror collection out too, Tales From The Mists. Both of those are available these days as the Tales From The Tower collection, rolling all of the year one stories of Inklings Press into one volume. Science fiction came next (Tales From The Universe) but here's where Brent gets blamed. He went and suggested alternative history for the next one. 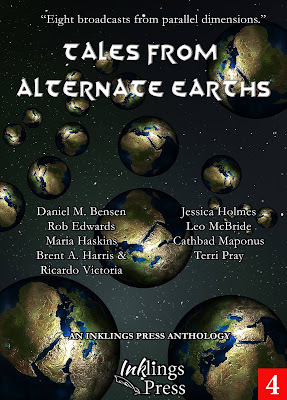 And so the word went out for submissions to Tales From Alternate Earths, which published a year ago today. Brent's a big fan of alternative history. He's had his nose poked in books by Turtledove or Sobel for a long time now - and he's got his own alternative history novel out next month (more on that here at the blog in future). His driving force led to the choice of the stories for inclusion in the final anthology - and a smashing bunch of writers it is - and... well, I guess I can blame him again for something else. Two stories from the book got nominated for the Sidewise Awards in the Short Form category. Brent's own story - jointly written with Ricardo Victoria - is a story of time travel and dinosaurs. Well, time travelling dinosaurs, in point of fact. Then there's Daniel Bensen's tale, Treasure Fleet, in which America is discovered by China rather than Columbus. This was the first chance I'd had to read Daniel's writing, his first submission to Inklings Press, and it was a delight to have him part of our hearty crew. He's since featured in our Tales of Wonder anthology, too. Both stories got shortlisted for this year's Sidewise Awards - due to be announced on Sunday. They're up against works by Anna Belfrage and GK Holloway, both from the collection 1066 Turned Upside Down; Adam Rovner, from What Ifs of Jewish History: From Abraham to Zionism; and Bruce Sterling, for Pirate Utopia. That's some darn fine talent to be among. Past winners in the short form include the likes of Stephen Baxter - a judge this year - Walter Jon Williams, Ted Chiang, Lois Tilton, Alan Smale, Mary Rosenblum and, well heck, lots more great writers. We'll give a hearty round of applause to whoever this year's winner is. It's a delight for two stories from the anthology to be included this year, and sets the bar high as we prepare for the September 1 deadline for the next alternate history anthology. And if that anthology proves as successful as this one has been? I'm blaming Brent. Tales From Alternate Earths is available on Amazon.